Compliance Orders, the forgotten enforcement tool? A defence view. In this comment piece, Proceeds of Crime Act specialist Barnaby Hone draws on his experience to highlight a currently underused area of the Proceeds of Crime Act 2002: Section 13A. This part of the Act, introduced by the Serious Crime Act 2015, was intended to assist prosecution authorities enforce compliance post-conviction. 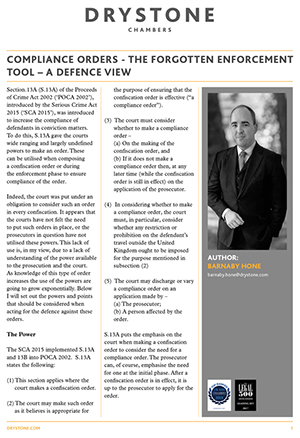 In the following article, Barnaby outlines the wide ranging reach of this act and how it might be used by the prosecution, expanding on areas where the prosecution might encounter issues and how the defence might go about appealing against the order. In addition to his busy practise, Barnaby writes the chapters on International Asset Recovery and Terrorism Finance for Millington and Sutherland Williams on POCA and recently completed a series of seminars and articles on changes to POCA under the Criminal Finance Act 2017. Barnaby is ranked in the Legal500 as a ‘leading individual’ in POCA and Asset Recovery law.